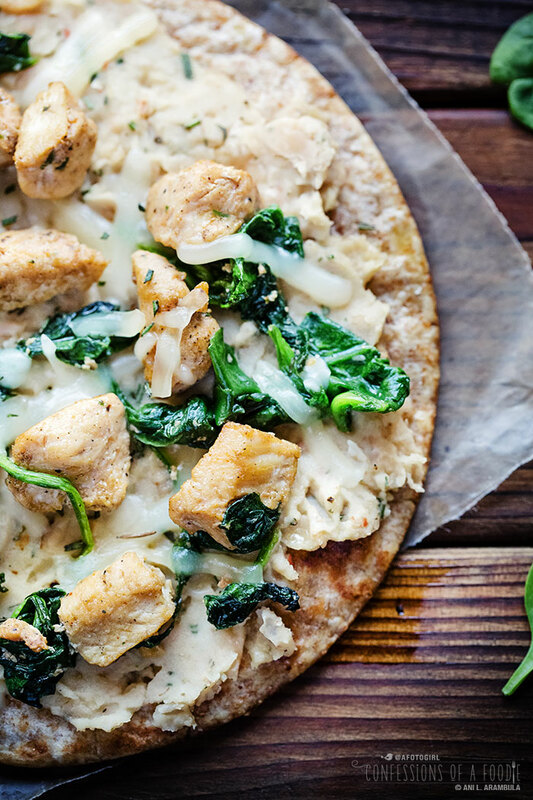 Foster Farms' new Sauté Ready marinated raw chicken cooks from frozen in 10 minutes for a quick and healthy meal like this Herb Chicken Flatbread with White Beans and Spinach. 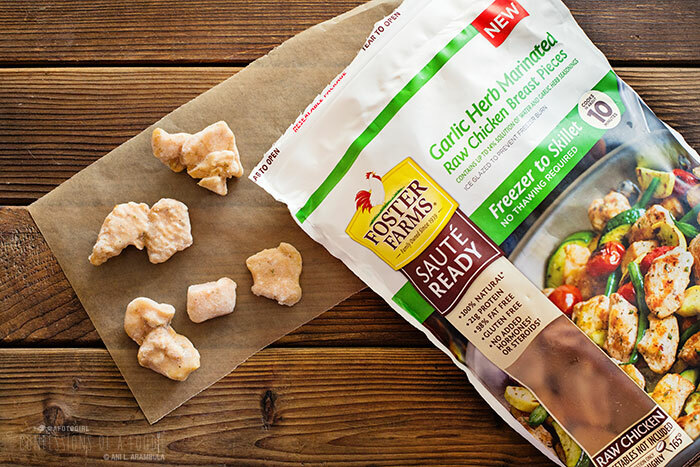 The latest offering from Foster Farms is called Sauté Ready: this is raw chicken that has been pre-cut into bite-sized pieces (well, some are more like growing man-sized pieces, truth be told), marinated in an offering of three different flavors (Asian, Fajita, Garlic Herb) that goes directly from frozen to skillet and is ready in 10 minutes. It comes packaged in a resealable 1.75 pound bag (that's 7 servings) and for single gals like myself, this is perfect because I can use what I need for a meal (and lunch the next day), then return the rest to the freezer for another recipe. 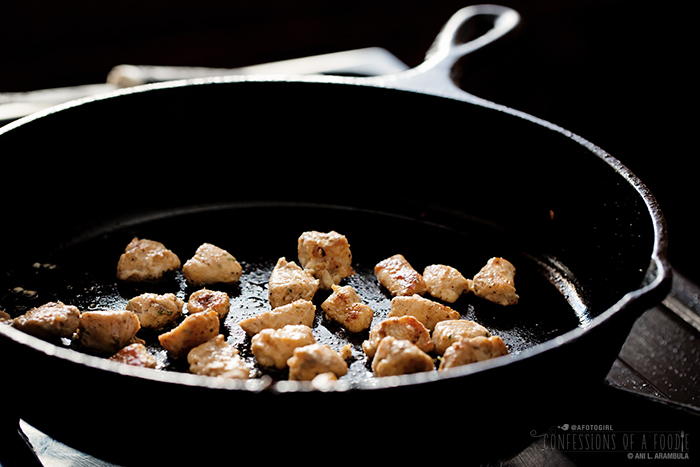 Sauté Ready is made from 98% fat free chicken breast with no added hormones or steroids. The marinades are gluten-free and the Garlic Herb that Foster Farms sent to me for review was 110 calories, sugar free with 21g of protein and 480mg of sodium per serving. I liked that I could see flecks of herbs covering every piece of chicken, becoming more pronounced as the chicken thawed directly in the skillet while cooking. 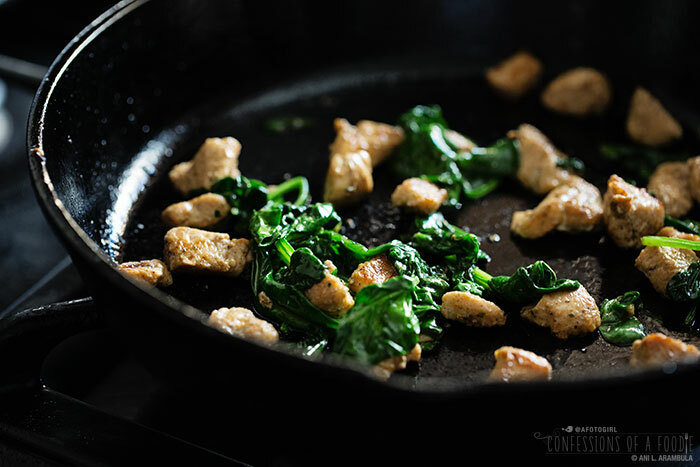 The chunks pieces – some small, some were strips – were a bit on the big size for the several recipes I used them in but as they cooked, I simply pressed my metal spatula into them, splitting the chicken into smaller, more bite-sized pieces. 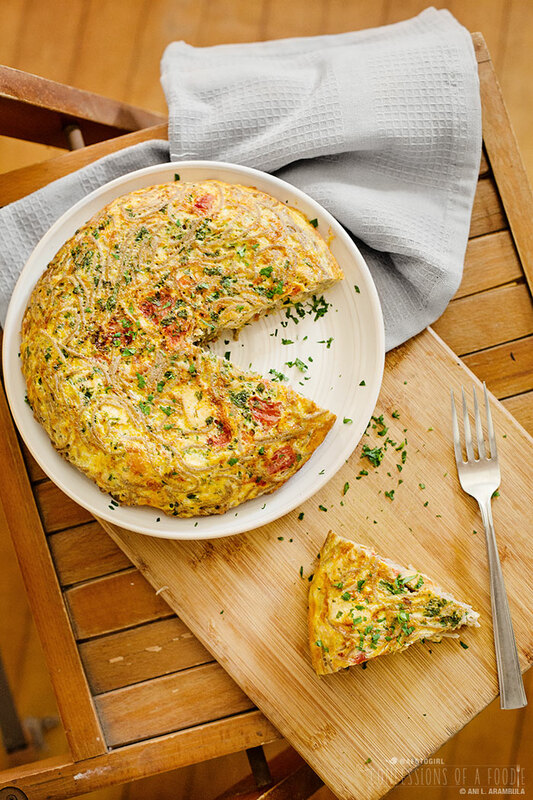 The first use was in a quick breakfast frittata made with eggs, soba noodles, mushrooms, onions, a roma tomato, parmesan and lots of fresh parsley. It made a great lunch the next day as well. A few nights later I used it for a quick skillet dinner with leftover whole wheat pasta (unsauced), red chard, onions, gruyere and panko bread crumbs with a quick finish under the broiler to golden up those bread crumbs. 20 minutes later I had a quick, relatively healthy dinner. 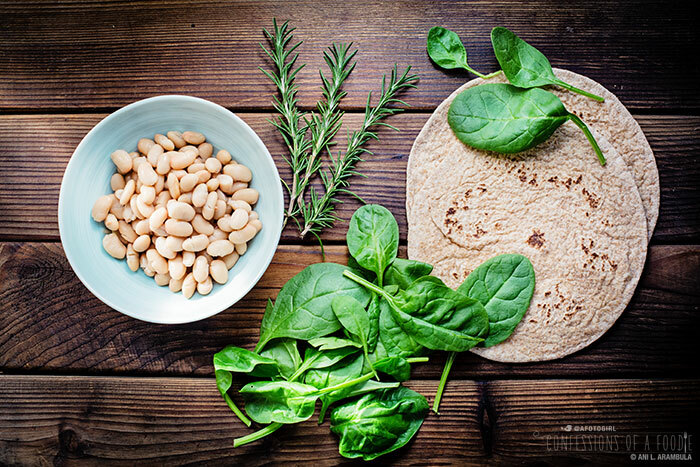 By the time the weekend came around, I opted to try something a little different for brunch and made a quick flatbread using packaged whole wheat Mediterranean flatbread, half a can of white beans, spinach and fresh rosemary. When you're starting with good ingredients, eating healthful, whole food doesn't have to be complicated or time-consuming. All the meals I made with this single bag of Sauté Ready were delicious, satisfying, quick and so much more healthful than stopping by drive-thru on the way home. I'm not exaggerating when I say that I doubt my freezer will ever be without this for nights when I want to eat something quick and healthy. A taco: Simply sautéed with a little lime juice and red pepper flakes, then wrapped in corn tortilla with shredded cabbage, avocado, cilantro, and some cotija cheese for taco night. A salad: Sautéed and used to garnish a big bowl of peppery greens like arugula and watercress topped with goat cheese and toasted almonds, then drizzled with a lemony mustard dressing. A sandwich: Sautéed with onions and mushrooms then stuffed into a roll with a little shredded Monterey Jack cheese then broiled just until the cheese starts to melt. The folks over at Foster Farms wants you to try Sauté Ready, too. They've generously sent me five coupons for 1 bag of Sauté Ready for a reader giveaway. I'm dividing the coupons between three readers: Two winners will get 2 coupons each and one runner up will get 1 coupon. To enter, you must use the widget below. The contest closes on Sunday, December 13, 2015. Rafflecopter will then randomly choose the winners, who will then have 48 hours to respond to my email. If they fail to respond in that time-frame, a new winner(s) will be chosen. Contest is open to U.S. residents only. I used Great Northern but any white bean will do (navy, cannellini, white pinto). The flatbread is from Trader Joe's. According to the Sauté Ready package, a serving is considered 4 ounces. However, for this size flatbread (about 6-inches) that felt like too much chicken, throwing the overall balance of flavors off. 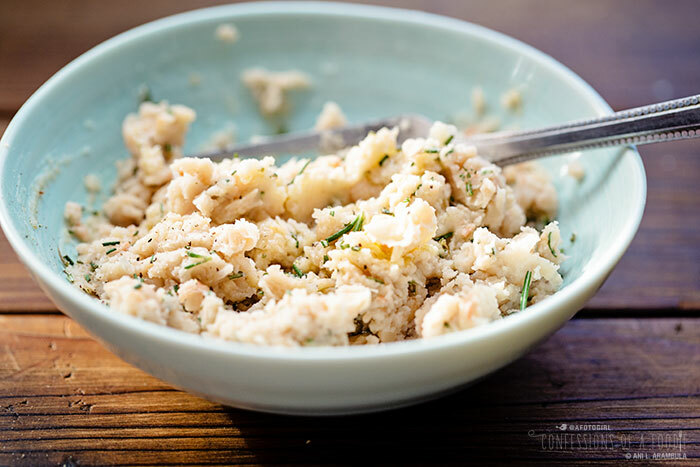 Using a fork, mash the beans until a thick paste forms. Stir in the rosemary and olive oil, thinning with a tablespoon or two of water, if desired, to achieve desired spreadable consistency. Stir in salt and pepper, to taste and a small squeeze of lemon juice, if using; set aside. Heat an 8-inch skillet over medium heat. Drizzle in the olive oil and once shimmering, add the chicken, mindful of the splattering. Cook until just starting to turn golden, about 10 minutes. 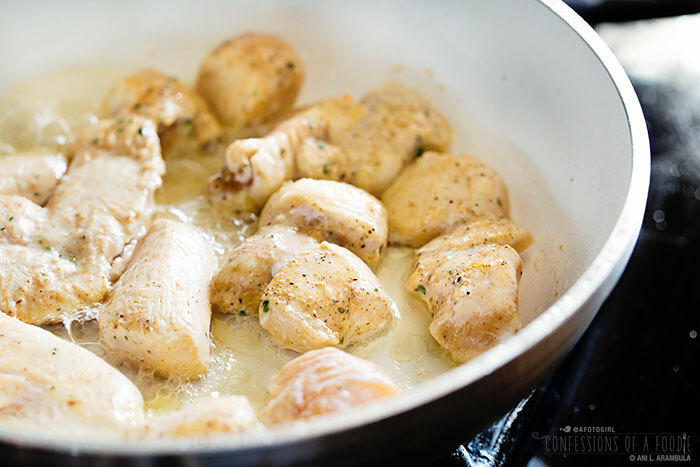 If desired, use your spatula to "cut" the chicken into smaller pieces as the chicken thaws in the pan. Add the spinach and cook, stirring, just until wilted, about 2-3 minutes. Remove from pan and set aside. Return pan to medium heat. Brush each side of the flatbread with some olive and add to the hot pan, toasting each side of the flatbread until just golden. Remove from pan and repeat with second flatbread. Divide the smashed beans between the two flatbreads, spreading to cover. Divide the chicken mixture between the two flatbreads. 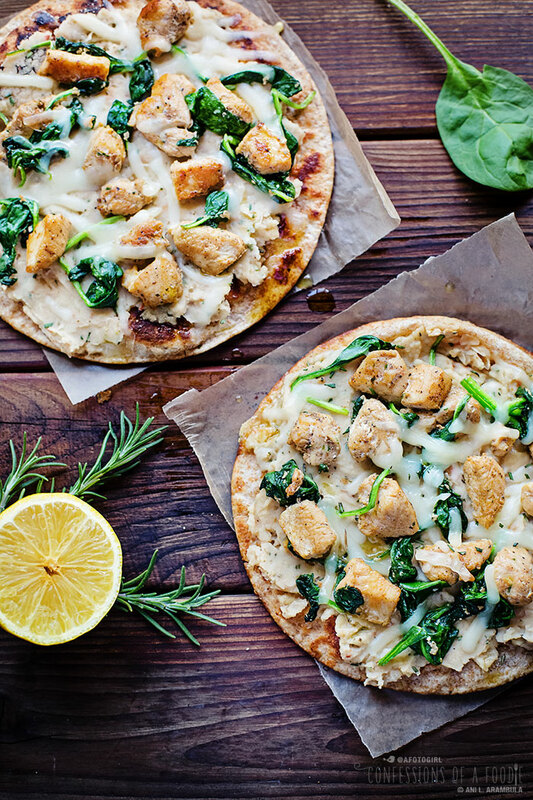 Top each flatbread with cheese. Place flatbreads on a large sheet pan and place under broiler for 1-2 minutes or until cheese melts and starts to bubble (babysit, do not walk away or risk burning your brunch). Drizzle with a bit of olive oil and sprinkle with a pinch of rosemary, if using, and sea salt just before serving. Cheese & chicken quesadillas are my fave go-to meal. My "go to" mid-week meal is frozen pizza.